by Tommy Goudge (July 19, 2013) – 97 drivers signed in to race on Autograph Night presented by Jones Brown Insurance and Evers Financial at Ohsweken Speedway on Friday, but severe weather caused 3 of the 4 scheduled feature races to be postponed. A brief rain shower at the end of the Gale’s Auto Aftermarket Bomber feature caused a brief delay. While work on the track surface was successful, it was ultimately decided that the safety of the fans and competitors was most important. Due to lightning and impending heavy rain, track management decided to cancel the remainder of the event. A storm did indeed hit the speedway minutes later, bringing heavy rain and lightning, and causing a power outage. 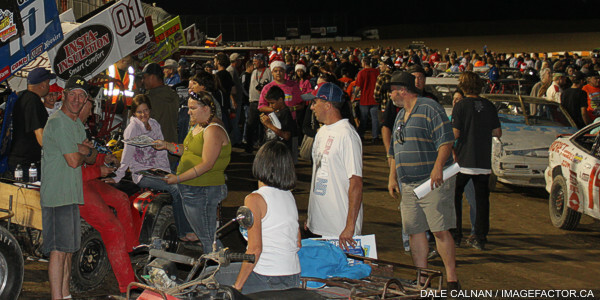 The autograph session planned for intermission has been rescheduled to next Friday night (July 26, while the incomplete features will be run at later dates: The Affordable Towing and Recovery Thunder Stocks will run their 20 lap feature on August 9, while the Corr/Pak Merchandising Sprint Cars will run their rescheduled feature on August 23, and the HRW Automotive Mini Stocks will complete their 15 lap feature on August 30. Each division will run both their rescheduled race and their regularly scheduled feature on the same night. According to the Ohsweken Speedway rain out policy 7 races were completed, and the event is considered official, therefore no rain checks will be issued. The 50/50 number has been drawn. The winning ticket number is 227555 on a yellow ticket. The prize of $427.50 can be claimed at Styres Gas Bar. Heat races for the 25 car field were claimed by Keith Dempster, Mitch Brown, and Jared Zimbardi. The postponed B-Main and Feature races will be run on Friday, August 23. Heat races for the 33 car field were claimed by Terry Martin, Karl Sault, Mike Thorne, and Brad Herron. The postponed B-Main and Feature races will be run on Friday, August 9. Heat races for the 26 car field were claimed by Brittani Myers, Jon Janssens, and Cahse Hess, while Lucas Lubin won the B-Main. The postponed Feature race will be run on Friday, August 30. Brady Longboat got the win in the rain-shortened Bomber feature. Points leader Dusty DeBoer ended up on his roof, and was not able to finish. Tim DeBoer, Wayde Thorne, Mark Bazuin, and Gillian Hils rounded out the top 5. 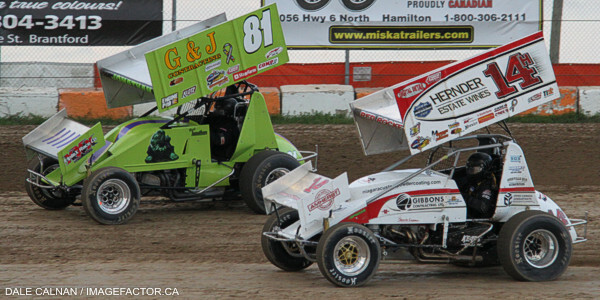 Heat races for the 13 car field were claimed by Brady Longboat and Max Chechalk. McDonald’s of Paris and Brantford presents “Christmas in July” at Ohsweken next Friday, July 26, featuring the Corr/Pak Merchandising Sprints, Affordable Towing & Recovery Thunder Stocks, HRW Automotive Mini Stocks, and Gale’s Auto Aftermarket Bombers, plus the rescheduled Autograph Night, and Kids Box Car Races. at 6:00pm, with racing starting at 7:30pm! 1. 5 Keith Dempster (Alton), 2.  f37 Kyle Moffit (South Dayton, NY), 3. 9nz Havard Daniels (Coatesville, NZ), 4. 07x Dain Naida (Tecumseh, MI), 5. 5c Conor Mahoney (Waterdown), 6. 49 Todd Hoddick (Cheektowaga, NY), 7. 01 Mikey Kruchka (Hamilton), 8. 43 Scott Sherk (Port Colborne), DNF. 90 James Evans (Beamsville). 1. 10 Mitch Brown (Brantford), 2. 0 Glenn Styres (Ohsweken), 3. 33k Kyle Patrick (Tilbury), 4. 3r Shane Ross (Thedford), 5. 11 Jamie Turner (Caistor Centre), 6. 81 Derek Jonathan (Lewiston, NY), 7. 7x Jamie Collard (Burford), 8. 94z Stan Zanchin (Fort Erie). 1. 35 Jared Zimbardi (Salamanca, NY), 2. 14h Jim Huppunen (Fenwick), 3. 80 Chris Steele (Fenwick), 4. 67 Steve Collins (Belfast, NY), 5. 27h Tom Huppunen (Fenwick), 6. 10j Jeremy Hughes (Burlington), 7. 52 Jesse Costa (St. Thomas), 8. 30g Steve Goldner (Aylmer). 1. 38 Terry Martin (Ohsweken), 2. 77 Brett Rodwell (Caledonia), 3. 777x Steve Hess (Ohsweken), 4. 17 Rob Disher (Grimsby), 5. 68 Aaron Turkey (Ohsweken), 6. 4 Dale Gyokery (Jarvis), 7. 00 Robbie General (Ohsweken), DNF. 911 Nick Liverance (Brantford), DNS. 57 Murray Nicholls (Hamilton). 1. 81 Karl Sault (Dundas), 2. 19 Cory Turner (Caistor Centre), 3. 33 Jack Myers (Wainfleet), 4. 28 Jim Lampman (Caistor Centre), 5. 10 Jake Brown (Brantford), 6. 11r Bryce Richardson (Port Colborne), 7. 84rk Ryan Beagle (Vittoria), 8. 44 Kevin Dawson (Caledonia). 1. 55 Mike Thorne (Caledonia), 2. 2 Lee Winger (Caledonia), 3. 31 Dave Bailey (Hagersville), 4. 85b Ryan Dinning (Caledonia), 5. 48 Mike Graham (Caledonia), 6. 3b Blaine Barrow (Welland), 7. 93 Melissa Miller (Ohsweken), 8. 119 Shawn Quinn (Caledonia). 1. 12 Brad Herron (Waterford), 2. 1 Chris Dickie (Brantford), 3. 91 Ryan Turner (Caistor Centre), 4. 73 Mike Miller (Cayuga), 5. 9 Dave Silverthorn, Jr. (London), 6. 29 Jim Gracey (Dunnville), 7. 85h Brad Bacher (Hagersville), 8. 04 Wyatt Van Wart (Cambridge). 1. 22 Brittani Myers (Hamilton), 2. 16 Jeremy May (Hamilton), 3. 66r Cole Rodwell (Caledonia), 4. 1 Kathi Dickie (Brantford), 5. 11 Mike Giberson (Caledonia), 6. 76 Jamie Goudge (London), 7. 69 Rob Twitchett (Dundas), 8. 84 Jade Pelletier (Wainfleet), DNS. 29 Lucas Lubin (Hamilton). 1. 66 Jon Janssens (Woodstock), 2. 21 Jonathan Ayrton (Hamilton), 3. 99 Robin Elliott (Woodstock), 4. 79 Steve Miller (Paris), 5. 05 Dave Goodacre (Brantford), 6. 38 John Cote (Hamilton), 7. 96t Mike Taylor (), DNF. 69e Dan Erskine (Caistor Centre), DNF. 10 Laura Hughes (Puslinch). 1. 7x Chase Hess (Ohsweken), 2. 81 Alex Schuts (Oakland), 3. 7 Jason Lungaro (Hamilton), 4. 265 Mike Evers (Caledonia), 5. 5 Rick Robinson (Brantford), 6. 4 Jason Coutu (St. Catharines), 7. 12 Chantelle Hyatt (Millgrove), DNF. 18x Davey Boughton (Carlisle). 1. 29 Lucas Lubin, 2. 18x Davey Boughton, 3. 10 Laura Hughes, 4. 96t Mike Taylor, 5. 69 Rob Twitchett, 6. 84 Jade Pelletier, 7. 12 Chantelle Hyatt, DNF. 69e Dan Erskine. 1. 66 Brady Longboat (Ohsweken), 2. 21 Mark Bazuin (Caledonia), 3. 43c Clinton Nicholls (Hamilton), 4. 32 Gillian Hils (Dundas), 5. 03d Dakota Potts (Waterford), DNS. 36 Skip Brandow (Orwell). 1. 97 Max Chechalk (Hamilton), 2. 23 Dusty DeBoer (Hagersville), 3. 88 Jesse McDonald (Caledonia), 4. 9 Tim DeBoer (Caledonia), 5. 6 Wayde Thorne (Waterford), 6. 199 Frank Turkey, Jr. (Ohsweken), 7. 14 Gerald Burnham.